This would be a good time to talk size. The QM2 is 1,132 feet long, which is only 117 feet shorter then the Empire State Building is high. She is 147 feet longer then the Eiffel Tower is tall. Onboard there are 1,550 miles of electric cable and 280,000 square yards of fitted carpet. Her hull alone weighs 50,000 tons – which is more then a school of 330 blue whales (that’s a lot of blubber). Her gross tonnage is 151,400. Then when you add the really gross tonnage of the passengers after 11 days of overeating (not us of course)… it’s remarkable that we didn’t flood downtown Lisbon with displaced water as we docked. A few years ago, we spend two weeks exploring Portugal and got a good taste of Lisbon. I am very grateful for that. Our 7 hours here was a complete washout. The 40 mphwinds shredded our umbrellas and we were soaked through within seconds. We were so looking forward to hanging out downtown and people watching in the parks. Lisbon is built on 7 hills; most are too steep for vehicles. There is a series of funiculars (elevators) that whisk people between the upper and lower city. The streets are narrow, and you often have to press your body against a building to let a car pass. Thankfully, all the side view mirrors are permanently tucked in, so they didn’t shave off last night’s Chocolate Moose with Raspberry Puree. Do you know the difference between an Ocean and a Sea? I didn’t, so I looked for a proper definition in the ship’s library (with over 8,000 books and a dedicated librarian, this self-proclaimed book worm is in heaven). A Sea is fully encompassed by land – with a small opening in and out. An Ocean borders land in some places but is not surrounded by it. The North Atlantic Ocean spewed us into the Mediterranean Sea through the Straights of Gibraltar this morning. This narrow stretch of water separates Africa from Europe; with Morocco to the South, and Spain to the North. It is only 7.5 miles across at the narrowest point. The straights were known to the ancient Greeks as the “Pillars of Hercules”. 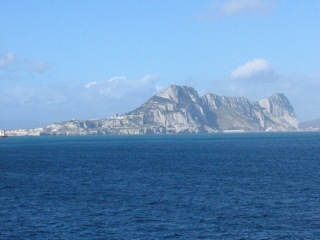 The attached photo is the Rock of Gibraltar, taken today. It is owned by England (what?) and Spain still wants it back. Africa too. Throughout the early morning, with our course change from South to East came a welcome change in wave direction from rolling to “following seas”. The waves are still about 15 feet, but they are pushing us from the back – and the movement is barely perceptible. The (more intelligent passengers), like my recently resurrected husband, are down right giddy. The Stabilizers (they deserve the capital S) on the QM2 are life sustaining. They reduce the rolling motion by a whopping 80%. There are 2 on each side, protruding from the hull. They are the shape and size of a jumbo jet’s wing, and are constantly self adjusting to the the water’s direction and force. When their job is done (although they have not taken a break yet) … they nestle against the hull until called again to duty. Let’s hope they never join a Union. We finally needed sunglasses today – after packing them away last Fall. It is much brighter down here and the sun is toasty. It’s about 65 degrees and the water is a “Chamber of Commerce” turquoise blue due to silt and sand runoff from the African coast. After passing through the Straights, the land spread out again and there was nothing ahead but endless sea dotted with a few islands. We passed by the Balearic Islands of Ibize, Mallorca, and Menorca today (consult your Atlas). Later tonight we will pass between Corsica to the North and Sardinia to the South into the Tyrrhenian Sea (which is a sub-sea in the Mediterranean). Tomorrow morning we arrive in Civitavecchia, Italy, our gateway to Rome. We are doing “Rome on our Own” and will take a bus to the city. We have been before, and really look forward to exploring Old Rome again.Tshau! (Good Bye in Portuguese) For Now!